Be the first to share your favorite memory, photo or story of Lucille. This memorial page is dedicated for family, friends and future generations to celebrate the life of their loved one. Mrs. Lucille Albright Ponder, 98 of Quail, died Sunday, September 23, 2018 at her home. She was born in Pulaski County, KY on June 15, 1920 the daughter of Russell and Florence Major Albright. 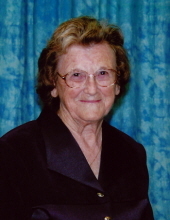 She was a farmer and homemaker who loved quilting and gardening. She was a member of Fairview Church of Christ. She is survived by her children, William Elmer "Billy" and Lorene Ponder, Deborah Lynn and Thomas Philbeck, Phyllis Ann and Eddie Brock, Judy Carolyn and Mike Feldkamp, Thelma Jean and Donald Ray Bullock, and Linda Louise and Harold Ray Reynolds; sixteen grandchildren, Ryan Ponder, Gretchen Ponder, Anthony Philbeck and Ruth, Felicia Lamb and Bobby, Mike Philbeck and Kelly, Bill Philbeck and Monisa, Jennifer Cook and Sherman, Roxanne Mink and James, Jamie Reynolds, Rhonda Prewitt and Doug, Rusty Owens and Amanda, Jeremy Owens, Tana Shumate, Donna Hyden and Aaron, Joey Reynolds and Melissa, and Emily Rader and John; 23 great grandchildren; and three great-great grandchildren. Also surviving are several nieces and nephews; a sister-in-law, Edith Ponder; and her cat, Milo. In addition to her parents, she was preceded in death by her husband, William Elmer Ponder; two sisters, Verla Mae Casey and husband Charles, and Alice Cupp and husband Charles; and a son-in-law, Billy Wayne Owens. The family of Mrs. Ponder would like to acknowledge and thank her caregivers, Barbara McKnight, Mary Thompson, Debbie Bullock, and Marquitta Oswald. To plant a tree in memory of Lucille Ponder, please visit our Tribute Store. "Email Address" would like to share the life celebration of Lucille Ponder. Click on the "link" to go to share a favorite memory or leave a condolence message for the family.